Fill Out This Form to Connect With Other Math Teachers On Kahoot! There are thousands of public Kahoots! made by teachers to chose from. Kahoot! has a search feature that allows you to search by title, subject, tag, or username. You can also share a Kahoot! that you have made with another teacher if you know their username. Since my Kahoot! post, I have found that many math teachers that I know also use Kahoot! and are using it in ways that I have not even thought of. For instance, Laura Wheeler uses Kahoot! a few times a week as a warm up for a fun way to do spiraling reviews. I would love to easily find and see her reviews, since we both teach high school math. Then, as is often the case, an amazing idea was born on Twitter. Wouldn’t it be GREAT if we knew our math teacher friends Kahoot! user names? Then, we could search and share with teachers that we know. Additionally, if teachers would tag the Kahoots! they use with MTBoS, we could also search that way. So, please fill out this form if you are interested in easily sharing the Kahoots! that you create and use with other math teachers. I asked for the subjects you teach so that other teachers can more easily find teachers that have similar needs. And don’t worry if you don’t make your own Kahoots! I rarely make Kahoots! from scratch. But, I do go through each Kahoot! I use carefully, and often edit them, so other teachers would probably benefit from the Kahoots! that I use. If you are not already using Kahoot!, you need to sign up for a free Kahoot! account here to get your username. 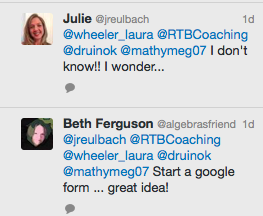 Here are the results: Google Form of MTBoS Kahoot! user names. Once you finish the form, you will be directed to a Google Form of MTBoS Kahoot! user names. How to Search and Add Tags in Kahoot! 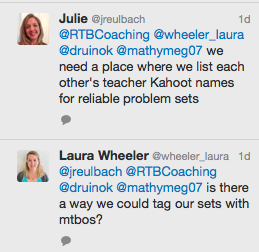 Also, to search by tag, you can’t just enter mtbos. You have to type in doc.tags:mtbos. Don’t forget to tag your Kahoot! with MTBoS after you finish making it. This entry was posted in Activities, Games, Integrating Technology and tagged kahoot, technology by I Speak Math. Bookmark the permalink. You rock my socks! Thanks for being so organized and now I look forward to putting some more Kahoot in my game! Awesome! We just need to get the form out there so the GDoc isn’t so empty. Lol! Thank, Julie! Great idea(s) – first sharing the Kahoot website, and now this! Have an awesome time at TMC!! I am in! How do I access the form to fill out? Thanks.